The best kind of deal is the one that doesn’t cost a thing. 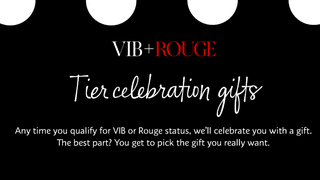 Sephora VIB and Rouge members have been granted one such promotion, with the beauty retailer’s Tier Celebration Gifts. VIBs and Rogues can select their choice of two or four free makeovers, 500 or 750 points, or free standard or flash shipping for a year, respectively. And the best part? There’s no additional purchase necessary. Now go pick your present, and don’t say Sephora never gave you anything.